A customized 2x3.5 business card magnets outdoor safe may not magnanimity and charm of a billboard or multimillion media advertisements, still it can buy you some quick glances. It suits marketers trying had to put their business messages across mass customer segment. This business card magnet is outdoor safe and made up of UV coated material, which means you can be contented that it is not going to fade when exposed to harsh sunlight. It may not attract attention from long distance; still you can make it work by getting it done with appealing business messages. 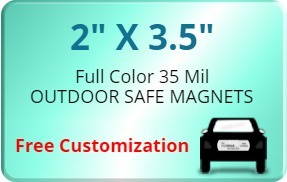 Request a quote to know discounts on bulk orders of customized 2x3.5 business card magnets outdoor safe.